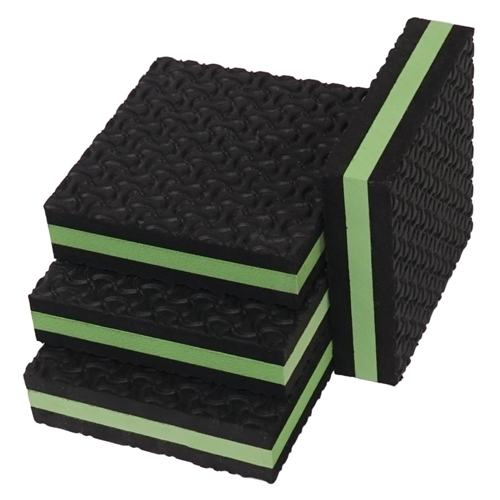 TriCore Vibration Isolation Rubber Foam Pads | 1" x 4" x 4"
TriCore Rubber Foam Pad, Green Series, SET of 4, 1" x 4" x 4"
TriCore Rubber Foam Pads, 4" x 4", isolate vibration from compressors, generators, pool pumps, A/C units, and a variety of other machinery or equipment. Install TriCore Rubber Foam Pads under the noise source to reduce the vibration transmission. Dimensions: 1" x 4" x 4"
TriCore Rubber Foam Pad, Green Series , 1" x 18" x 18" TriCore Rubber Foam Pad, Green Series Case, 12 per case, 1" x 18" x 18"